Stepping into the Plaza Theatre on the night before Halloween felt like stepping back in time — the lobby was decorated in bold primary colors, velvet ropes guided patrons to the concession stand, vintage movie posters adorned the walls, and the smell of buttery popcorn wafted through the air. The venue was simply the perfect place for a local film festival. That night the theatre hosted the Return of the Fifty Foot Film Fest, an event that featured eight spooky and suspenseful short films. It was the successor to last year’s Attack of the Fifty Foot Film Fest, which sold out — no small feat for a debut festival. The unique feature of the Fifty Foot festivals is that all of the shorts are made in Atlanta by Atlanta filmmakers and premiere in Atlanta. No awards are given out, either, removing the competitive nature that most film festivals have, making sure Fifty Foot is just for fun. On Oct. 30, it was evident that the festival was a community driven event to celebrate local artistry, and, of course, to get in the mood for Halloween. Inside the auditorium, the screen was framed by thick velvet curtains. Nearly every seat in the house was filled. A chattering buzz filled the air. At exactly 7 p.m., the lights were dimmed, the projector flashed on, the crowd quieted and the festival began. The festival opened with “Feast” by Melissa Kunnap. The ten minute short begins with an intern’s invitation to his boss’s celebratory dinner and ends with him on a platter, quite literally, as the dessert. The film is tropey, but it set the campy tone of the rest of the night. If the festival gave out awards, “Living Nightmare” by Jonathan Gabriel and Kristina Miranovic would have been a clear front runner. The film has three parts, each focusing on a real nightmare an interviewee has experienced. The viewer quickly becomes ensnared in the dreams portrayed on screen. The production quality is spectacular. The first nightmare has a repetitive quality, trapping the viewer in an inescapable cycle. The second is a chase sequence through an increasingly dilapidated train and builds suspense magnificently. The third brings back childhood nightmares of monsters creeping from closets and under beds. Another short that stood out was “Pet” by Justin Craig. While the entire film contained maybe 10 spoken words, it is hard to forget any second of the chilling tale, nor the juxtaposingly heartwarming resolution. There’s a distinct classic horror vibe to the film that does not rely on gore imaginary monsters, only the twisted terror of that can come from mankind. In spite of the quality of the films at the festival, the most memorable part of the evening was the audience. Each short’s title sequence was met with uproarious hoots and hollers. It was clear that family members and friends of the filmmakers littered the crowd. Different sections of the theatre would erupt for each film. Names that could only belong to associated creators, writers, actors or crew members were cheered. Even throughout the films, audience members were unable to remain silent; comments, gasps, humorous quips could be heard despite a few attempts at whispering. While this sort of audience participation is annoying when watching the latest Marvel blockbuster at Regal Cinemas, here in the Plaza Theatre it only added to the cozy, local feeling of the fest. Patrons were not just watching a movie in a sea of silent strangers. The fest was a group experience, a celebration of Atlanta creativity. After the screening, directors, writers and producers were invited to the stage to talk about their movies and answer questions. Creators were able to talk a little about the production of their films and promote upcoming projects. 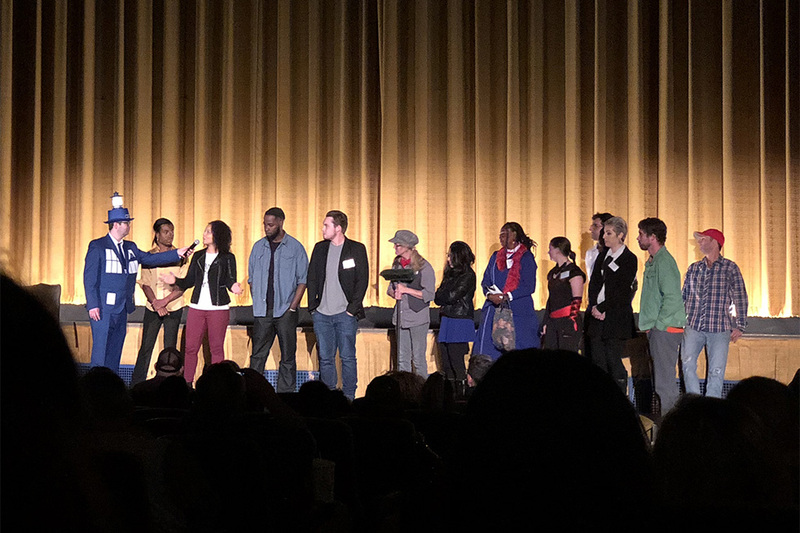 This opportunity to put faces to movies and learn about the Atlanta film industry highlighted just how local this fest was. The Return of the Fifty Foot Film Fest is a perfect Halloween eve activity for anyone looking to get in the spooky mood, have a good laugh and get a taste of what Atlanta is all about.